The future pastor was educated at the Volhynia Seminary and the Saint Petersburg Theological Academy, from which he graduated with a Master’s degree in 1895. After graduation from the Academy, he was sent for missionary service to the Diocese of the Aleutians and North America, where he was assigned to the position of reader at the newly-established Saint Nicholas Orthodox Church in New York City. Following his marriage to Maria Scherbuhina, a graduate of the Pavlovsk Institute in Saint Petersburg, the Hieromartyr Alexander was ordained to the diaconate, and soon after, on February 25, 1896, to the priesthood by Bishop Nicholas (Ziorov) of the Aleutians, whom Father Alexander would always later remember with gratitude and love. During the difficult years of the Civil War, the New Martyr Alexander collaborated closely with Saint Tikhon in the administration of the Moscow diocese. In 1918, under the spiritual leadership of the rector, Father Nicholas Arseniev, and the assistant pastor, Father Alexander, a brotherhood affiliated with Christ the Savior Cathedral was established. As its first activity, the brotherhood issued an appeal to the Orthodox flock, which Father Alexander helped write. On trial in this case were 105 clergy and laity. Among the main defendants were Archpriest Sergius Uspensky, dean of the second district of forty churches in Prechistenka, Archpriest Nicholas Arseniev, dean of Christ the Savior Cathedral, Archpriest Alexander Hotovitzky, assistant pastor of this Cathedral, Ilya Gromoglasov, priest of Christ the Savior Cathedral, Lev Evgenievich Anohin, warden of this Cathedral, and Archpriest Simeon Golubev, rector of Saint John the Warrior Church. 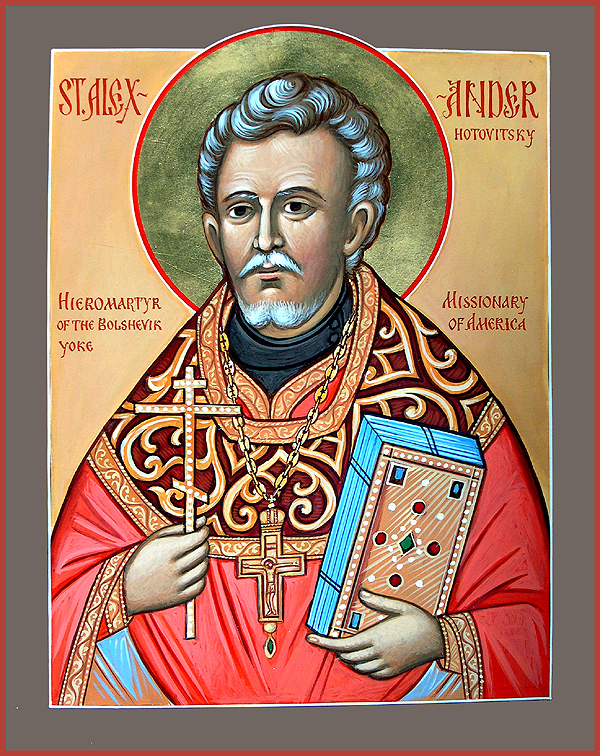 The Church of Russia also commemorates Saint Alexander on August 7, along with the Archpriests Alexei Vorobiev, Michael Plishevsky, John Voronets, the priests Demetrius Milovidov, and Peter Tokarev, the deacon Elisha Sholder, and Igumen Athanasius Egorov.